We are delighted to feature a guest blog from the Networked Quantum Information Technologies hub (NQIT), the UK quantum computing technology hub. NQIT is the largest of the four hubs in the UK National Quantum Technologies Programme. As well as achieving key milestones in the development of hardware and software, core to NQIT’s mission is creating a quantum computing sector in the UK. This will include creating new industry opportunities and developing new skillsets geared toward exploiting this new computing power. Here we discuss progress and current initiatives that we are running in pursuit of these goals. Here at NQIT, we continue to lead the UK’s efforts in quantum computing and simulation and have made significant progress in multiple approaches to qubit development, the interconnections between qubits, and engineering systems integration. Our work takes in all aspects of the emerging quantum information technology economy – from collaborations with the supply chain, to supporting and engaging with the emerging software sector, to growing a base of skills and awareness. A number of our innovations have created spinout technologies and companies. The 700 plus visitors to the National Quantum Technologies Showcase, held in central London in November 2018, had the chance to see the significant progress that has been made by NQIT. Left: Professor Winfried Hensinger at the Sussex Modular Microwave Ion Quantum Computer stand. Right: Shazeaa Ishmael, a Diamond CDT (Centre for Doctoral Training) student working within the NQIT programme, pictured with a model of a diamond lattice, illustrating the properties of a diamond that are being explored for creating solid state qubits using lasers. Through a number of initiatives we have been able to encourage and support future users from science and industry to get access to early experimental platforms, be informed of their use and participate in initiatives that will help the development of future applications for quantum computing. With access to near-term platforms for experimentation and our emulator programme, scientists, engineers and industrial researchers are encouraged to learn about the potential future range of applications – from simulating new molecules to enhancing artificial intelligence, whilst the hardware is being developed. We have two exciting new projects for 2019, the Quantum Readiness Programme and a collaboration with the Satellite Applications Catapult. 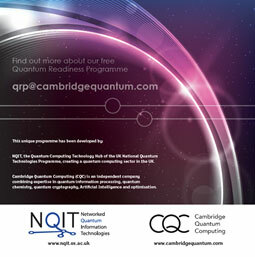 In partnership with Cambridge Quantum Computing (CQC) we launched the UK Quantum Readiness Programme (QRP). Designed to provide UK corporations and organisations with the knowledge required to understand the opportunities presented by quantum computing and associated quantum technologies. How do quantum computing and quantum technologies affect our strategic plans and business plans; and how do we prepare adequately so we benefit from the new paradigm in computing that’s represented by quantum computers? 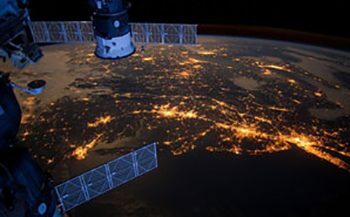 Our second initiative involves working with the Satellite Applications Catapult to bring together experts from quantum computing and the space sector. At our discovery workshop in November 2018, we looked at how quantum computing could help in areas such as simulation and modelling, and optimisation and earth data – all involving challenges for the space sector. We then brainstormed use cases in these areas to test them further. 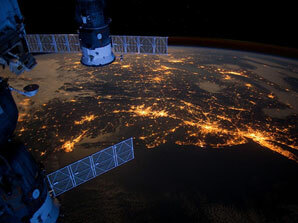 To that end, on 15 March, NQIT and the Satellite Applications Catapult announced we will be holding a quantum computing hackathon for the space sector in Oxford. Having catalogued how quantum computers could be used to address space sector challenges at the November workshop, the hackathon will offer participants the opportunity to delve further into these challenges and apply their coding skills to propose solutions, as a member of one of the hackathon teams. Our hackathon partners – Riverlane and Dividiti – bring considerable experience in running quantum computing hackathons. Making the hackathon a must for those interested in developing their knowledge, to learn to program a quantum machine and to develop a road map for an industry-relevant application. At NQIT we will continue to work with leaders in both the private and public sectors to explore all practical areas where future applications that exploit the unique possibilities of quantum computing will revolutionise business settings and build competitive advantages. The UK government’s ongoing commitment to funding the UK National Quantum Technologies Programme, which includes establishing a new National Centre for Quantum Computing, will accelerate the progress towards creating a quantum computer and will keep the UK at the forefront of this exciting and fast-moving technology.